The new "Dishing With ..." segment occasionally appearing in this space will feature Q&As with local chefs, restaurateurs and other personalities. 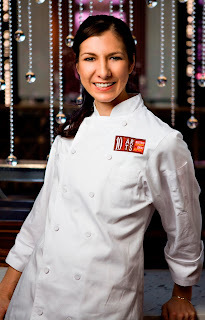 In this inaugural edition, pastry chef Monica Glass of 10 Arts Bistro & Lounge in Center City Philadelphia explains how having celiac disease hasn't affected her passion for designing desserts, what she does to express her creativity outside of the kitchen, and whether she'd ever appear on a reality-TV cooking show. How did you get interested in becoming a pastry chef? As a child I had always enjoyed cooking and baking. That love continued into college, where friends dubbed me "Chef Moni" for the dinner parties I often threw. But I never really thought of it as a career until after a brief flirt with the corporate world. My job in public relations didn’t really excite or inspire me. I had plenty of free time - I didn’t really know anyone, having just moved to New York City - and no money. So I wanted to utilize that time in an efficient way and decided that I wanted to learn to cook and bake better. After making a list of all the pastry chefs I admired, I went to my top choice, Deborah Racicot at Gotham Bar and Grill, and pitched myself, my aspirations and why I wanted to learn from her. She must have seen something in me because she asked me to come hang out in the kitchen the following week. I loved it. Eight months of moonlighting later, Deborah graciously offered me the chance to join her team. And I’ve never looked back. You worked in New York before returning to the Philadelphia area, where you grew up. What's the biggest difference between working at restaurants there and here? That I’m only a quick walk away! In all seriousness, though, I worked at two incredibly inspiring and intense restaurants in New York City - Gotham and Le Bernardin. The pressure to do your best was always there, pushing the cooks to perform at top level. At Le Bernardin’s little sister [10 Arts], though we may be a little more casual, we really strive to uphold and maintain the same level of consistency and perfection. So overall, there really isn’t a distinct difference in the day-to-day operations and work ethics of the restaurants in the two cities. The main difference, however, is the autonomy and creativity I’m given as the pastry chef of 10 Arts. This is the first position in which I’m really thinking for myself. Previously as a pastry cook, I was given tasks to do, which I performed to the best of my ability in an effort to support and uphold the chef’s vision. Here, it is my responsibility to continuously evolve, experiment, and put out desserts that our guests will love. As a chef, I also believe it is my responsibility to inspire, teach and cultivate new talent. So every day I try my best to get my staff excited about our jobs, the ingredients, new recipes and techniques, and just life in general. After years of constant sickness – stomach problems, severe anemia, fatigue, low energy, gynecological problems – and countless tests, I was finally given a diagnosis in April 2009. What have you had to change about your work because of your diagnosis? Life after diagnosis was a challenge. Working with flour definitely triggers symptoms. However, it’s not going to keep me from what I love to do. Since I can’t eat much of what comes out of a pastry kitchen, I’ve really made a conscious effort to be diligent about cross-contamination and to create desserts that cater to people with celiac disease or food allergies. But I do still work with flour and make non-gluten-free desserts. I just can’t eat them myself. Tasting is a required part of the job, and I do have to taste what I serve every day. Only now, I only have a very tiny sampling and usually discreetly dispose of it. I also have a very dedicated team of taste-testers to help me out. What gluten-free desserts are available at 10 Arts? I always strive to have at least two gluten-free options on the menu at all times, and at least one or two more that can easily become gluten free with the omission of a simple component. Right now, there is a Banana Crème Brûlée with salted peanut sorbet, peanut butter powder, cocoa nib coulis and chocolate and a Crème Fraiche Mousse with blueberries, sweet corn sorbet and caramel popcorn. The Yogurt Panna Cotta and the Passion Fruit Parfait can be gluten free by omitting the cake pieces that hold the accompanying ice cream or sorbet. Of your gluten-free dessert recipes, which one is your favorite? Tough choice. I’m going to have to say ice cream. Out of my composed desserts, my favorite would probably be the “PB&J” dessert I did last summer [tahini crème brûlée with layers of sugar tuile, yogurt sorbet and a salad of grapes, halvah, black pepper and lemon macerated in fresh grape jus]. My inspiration was a peanut butter-and-jelly sandwich with a glass of milk. What are some of the gluten-free lunch and dinner options at 10 Arts? Much of the food and lounge menu offerings are gluten free – Corn Chowder, Beet Salad, Spring Vegetable Salad, Rabbit, Octopus, Sea Bass, Mussels, to name a few. When you're not eating at 10 Arts, where do you like to dine in the area? I wish I got to eat out more often, but any of Jose Garces restaurants, Mémé, Tiffin, Vic Sushi, Las Bugambilias, Bibou, Minar Palace, Audrey Claire, Good Dog, Osteria, Bar Ferdinand, Bindi, Varga Bar and Pub & Kitchen are all excellent. You also like to write. What do you write about and where can people read your work? I do like to write, but since moving to Philly and being engulfed by my job, I haven’t had anything published of late. However, the Pastry Princess blog on the Culinary Media Network will be resurrected shortly. Fingers are also crossed that I’ll make my way into bigger publications! I like to write about the beauty in life and moments of truly being awake in the world. Sometimes I write to remember or remind myself to wake up or slow down and be conscious of the world, whether that manifests itself through pastry - including tips, ingredients, new discoveries, experiments, stories - life and learning experiences, inspirations, random thoughts in my head, the local scene, or, of course, good food. 10 Arts' Executive Chef Eric Ripert and Chef de Cuisine Jennifer Carroll have appeared on TV's "Top Chef" competition recently [as judge and contestant, respectively]. Can we expect to see you on one of those dessert bake-off shows? I welcome a challenge and I never say never! 10 Arts Bistro & Lounge by Eric Ripert is located at The Ritz-Carlton, Philadelphia (10 Avenue of the Arts, 215-523-8273). Wow, a gluten-free pastry chef! Pretty amazing that Monica is so committed to making both traditional flour desserts and GF items. I hope she does end up on a competition TV show, she'll kill it!